A stay to hold a hinged window open at a selected distance usually by means of a peg or friction slide. Locking types are also available for added security. 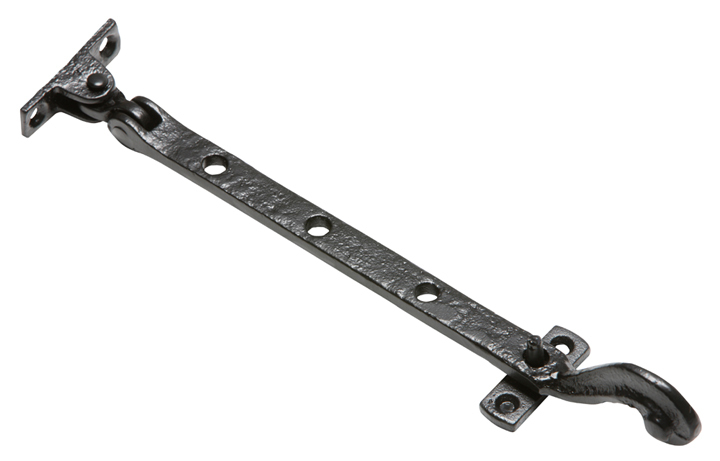 A casement stay is fitted to the bottom rail of a window and the pins or retaining guide are fitted to the frame. When the window is closed tightly, the holes along the length of the stay are positioned so they fit over the pins, securing the window. The pins can also be used to determine the angle of opening required for the window. It is possible to buy locking pins which work in the same way as an ordinary pin by locating in one of the holes along the stay. The top of the pin has a threaded nut which can be locked and unlocked with a key. These are usually available to match the finish of the window stay. A sliding casement stay as shown in image three has a retianing guide that the casement stay glides through. This guide has an adjusting knob and this can be tightened against the arm of the stay to set the angle of opening for the window.